Like, this is it. This is the one and only breakfast or cake or breakfast cake you'll ever need in your whole life. I don't even know why I named it a breakfast cake. Preheat oven to 350 degrees. Place butter in the bottom of a greased 9” round cake pan. Place the pan in the oven for a few minutes, until butter is just melted; remove from the oven and add one tablespoon of brown sugar and stir to combine. Dump about ¾ cup blueberries into the cake pan, toss with the butter and brown sugar, and form an even layer. Set the rest of the blueberries aside and set the prepared pan aside. Using a stand mixer fitted with the paddle attachment, mix together the eggs and remaining bowl sugar until combined, then whisk in the yogurt, oil, eggs, vanilla extract/paste until incorporated. In a separate bowl, mix together flour, oats, flaxseed, baking powder, baking soda, salt and cinnamon. Slowly add dry ingredients into the wet ingredients with mixer on low speed, just until combined. Fold in remaining blueberries. Pour batter into the prepared cake pan. Bake in the oven for 45-50 minutes, until a toothpick inserted in the center comes out clean. 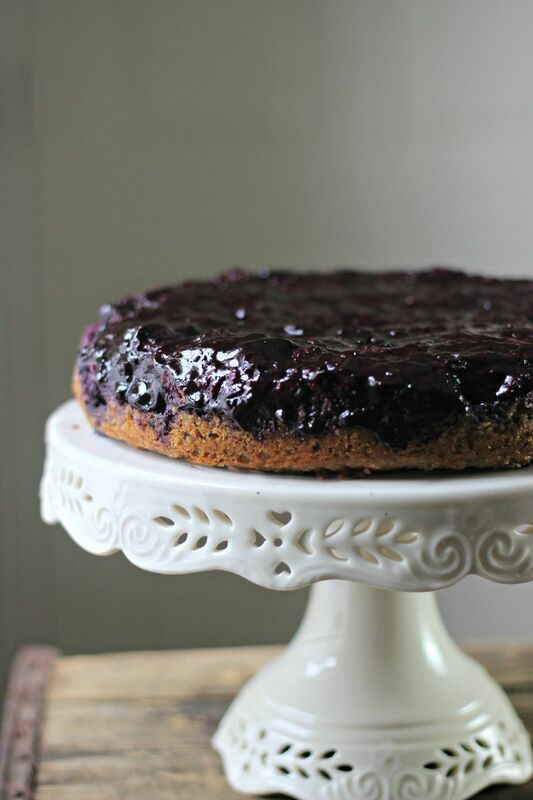 Allow to cool, then place a plate upside down on top of the cake pan and turn it over so the cake turns onto the plate with the blueberry topping facing up. Cut and serve.